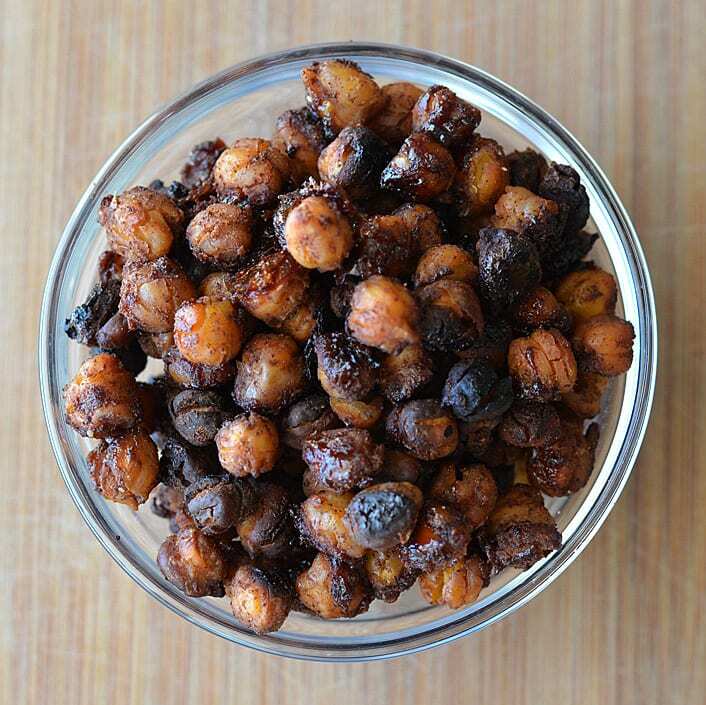 I loved the idea of candied chickpeas and these Spiced Candied Chickpeas have all of the flavors of fall. My idea was to use these as “croutons” on my Harvest Salad with Pumpkin Spice Vinaigrette. I rinsed and drained the chickpeas (be sure to soak overnight if you are using dried chickpeas). You can peel the skins (or not), I will leave this up to you. Peeled chickpeas make a cleaner end product. That being said, it is somewhat time-consuming to do. For the seasoning, I used the components of pumpkin pie spice. Cinnamon, nutmeg, ginger, allspice. I added a bit of salt along with a tsp of oil. For the sweetness, agave and coconut sugar, but you could use any sugar for this recipe. Toss well and using a slotted spoon, drain well and transfer to a lined baking sheet. This will keep them from sticking. Baking time may vary but you want them crunchy on the outside and not soft on the interior. Take care not to burn. 1 tsp Oil Canola, etc. Drain and rinse chickpeas. 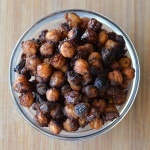 Rub the skins off the chickpeas with paper towels. They come off pretty easy. This step is not mandatory, but produces a cleaner end product. If you don't mind the skins, by all means...make it easy on yourself and leave them on. In a small bowl, combine all of the ingredients until evenly coated. Using a slotted spoon, transfer the coated chickpeas to a silpat or parchment lined sheet pan. Bake for 30-45 minutes or until chickpeas are crunchy. Mine were still slightly soft in the middle. Allow to cool before using. The sugar mixture will be very hot.